Apple’s new iPad boasts better colors – how did they do it? 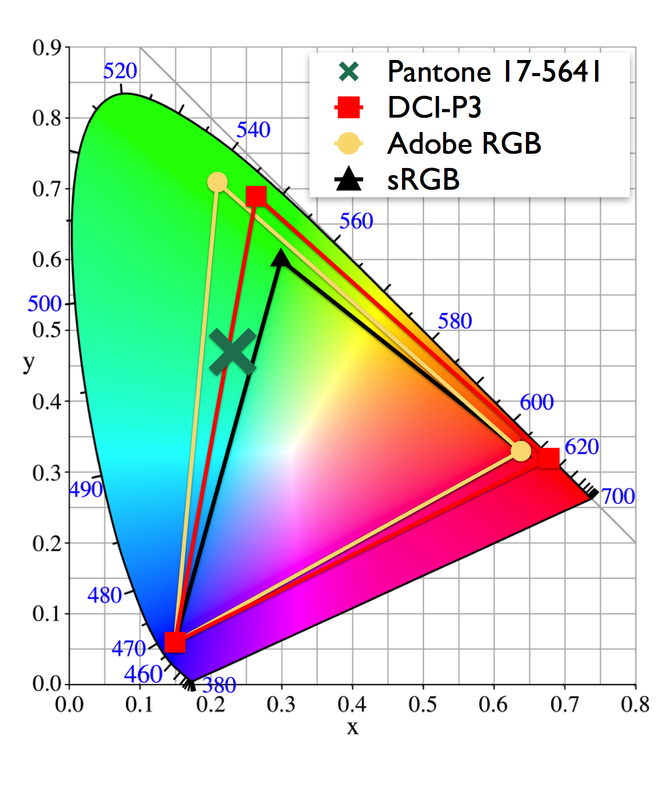 There are two ways to improve the color gamut performance of an LCD display: you can either make the backlight better or the color filters better. In both approaches, the goal is the same: to make red, green and blue light as pure as possible. The LCD display mixes these three primary colors to make all the other colors you see on screen, thus, the more pure the individual pimary colors are, the better all colors on screen are. Based on our measurements, it looks like Apple focused on the color filters for this new display, let’s take a closer look. In the color spectrum chart below, you can see the result of some of the color filter changes that Apple made. Notice how the red peak (on the right, in the 600 nm range) has moved to a longer wavelength. 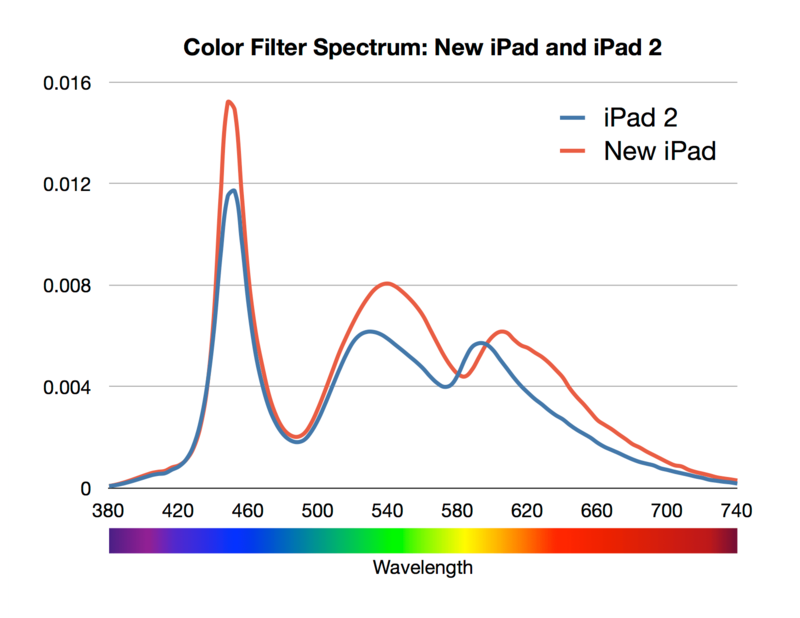 This change in wavelength means reds on the new iPad will have a deeper hue, will be less orange and more distinctly red. Another interesting thing to look at here is the blue peak at about 450 nanometers. In our last post, we noted that blue got the biggest boost with the new display. However, the blue peak did not change in wavelength or in shape, only amplitude (or brightness), which does not affect color. 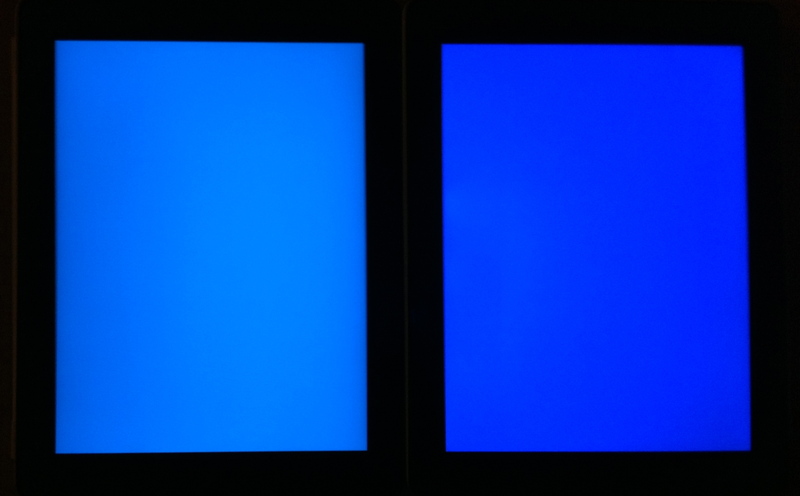 So what explains the dramatic improvement in blue seen on the new display? The above spectrum isn’t telling the whole story. It was measured from a white screen, in other words a screen with all three primary colors turned on. We see very different results when looking at a screen with a blue image, where only the blue sub pixel filters are open. This chart shows us only the light that is allowed to pass through the blue color filters. We can see the same blue peaks that we know from the white spectrum, but there’s also some extra light getting through – notice the two small tails to the right of the blue peak? That’s green light from the backlight leaking through the blue filter. This means that when the iPad display needs blue light to make an image, some of that green comes along with the blue whether you want it or not. You will notice that the green blip is smaller on the new iPad, meaning less green is leaking through and a purer blue is displayed. Take a look at the comparison shot here and you can see how just a hint of that green leakage is making the iPad 2’s blue (on left) appear slightly aqua by comparison. Leakage like this happens because its very difficult to make a truly perfect color filter and even harder to make one that is efficient enough for a mobile display. The reason is basic physics – a better color filter is narrower, allowing only the desired color through. However, the narrower you make the filter, the less light it lets through, and less light through means the display has to be driven harder to maintain brightness. 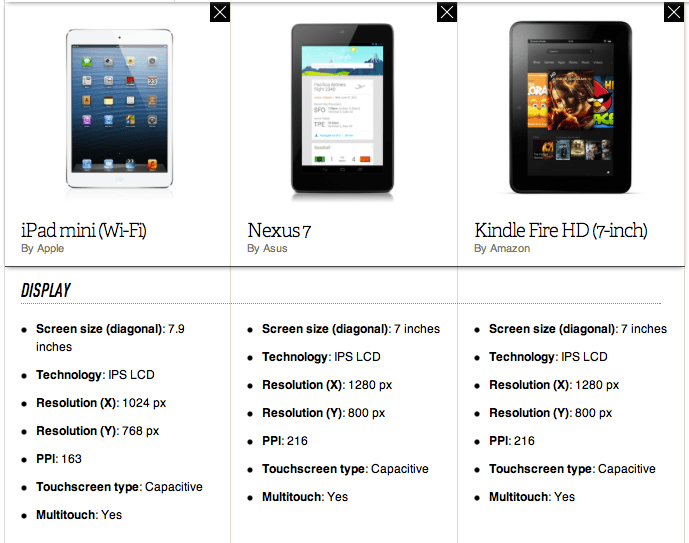 This directly affects battery life, partially explaining the new iPad’s need for a larger battery. Based on our experience, we estimate that the color improvements alone in the new display probably cause it to consume about 20-30% more power than the iPad 2’s screen. Perfecting the color performance of a display is a critical engineering challenge and worth highlighting because its one of those tiny details that Apple is so great at. Just making this small improvement in light leakage from iPad 2 to the new iPad accounts for a stunning amount of improvement in color performance and, most importantly, it makes for a richer user experience. Which brings us to an immovable object meeting an irresistible force. Apple doesn’t make new devices which get worse battery life than the version they’re replacing, but they also don’t make new devices that are thicker and heavier. LTE networking — and, I strongly suspect, the retina display3 — consume more power than do the 3G networking and non-retina display of the iPad 2. A three-way tug-of-war: 4G/LTE networking, battery life, thinness/weight. Something had to give. Thinness and weight lost: the iPad 3 gets 4G/LTE, battery life remains unchanged, and to achieve both of these Apple included a physically bigger battery, which in turn results in a new iPad that is slightly thicker (0.6 mm) and heavier (roughly 0.1 pound/50 grams, depending on the model). 50 grams and six-tenths of a millimeter are minor compromises, but compromises they are, and they betray Apple’s priorities: better to make the iPad slightly thicker and heavier than have battery life suffer slightly. This point can’t be understated. 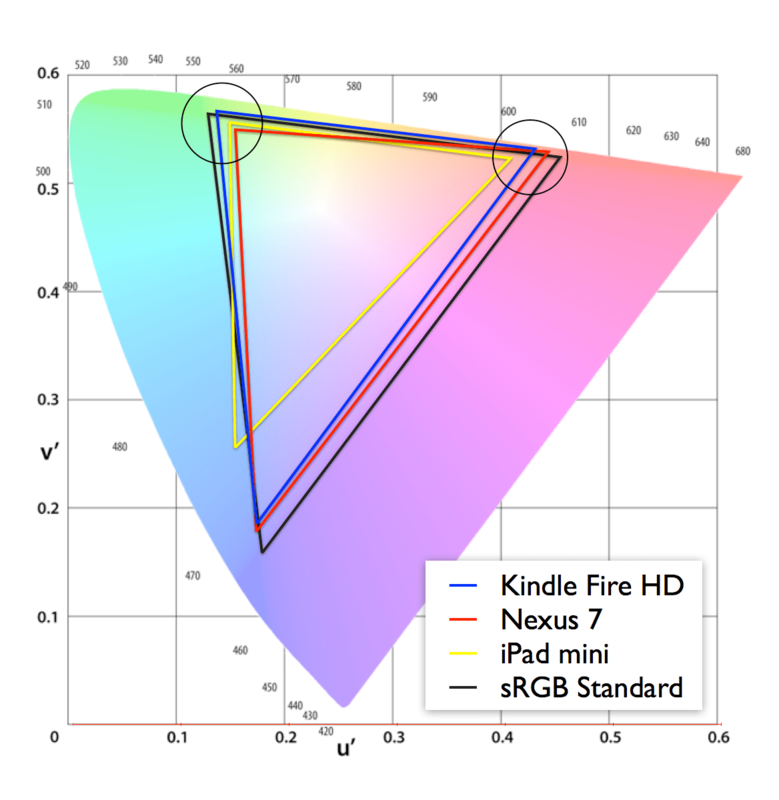 For Apple, the quality of the display, both in terms of resolution and color gamut, is so critical to the experience of using an iPad that they were willing to make some major tradeoffs. In this case they not only ended up with a slightly thicker, heavier device, they also used a significantly more expensive part. The end result is a stunning display that amplifies everything that was already great about the iPad 2 so it looks like a tradeoff worth making. 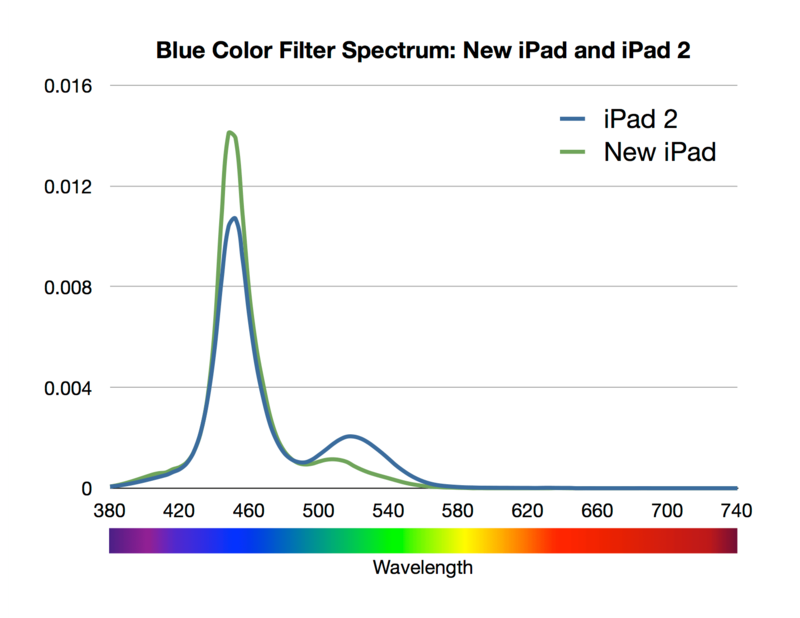 We took some color performance measurements of our new iPad this morning and we’ll be posting more details shortly.